Predating Disney’s film to the same classical piece by seven years, this ‘video clip’ to the music of ‘Night on Bald Mountain’ by Modest Mussorgsky is an impressive mood piece. The Russian-French artist Alexeieff animated ‘Une nuit sur le mont chauve’ on a so-called pinscreen, a device he invented himself , and which consists of a screen with numerous pins, which can be pushed further in or out, to produce a shadowy image together. 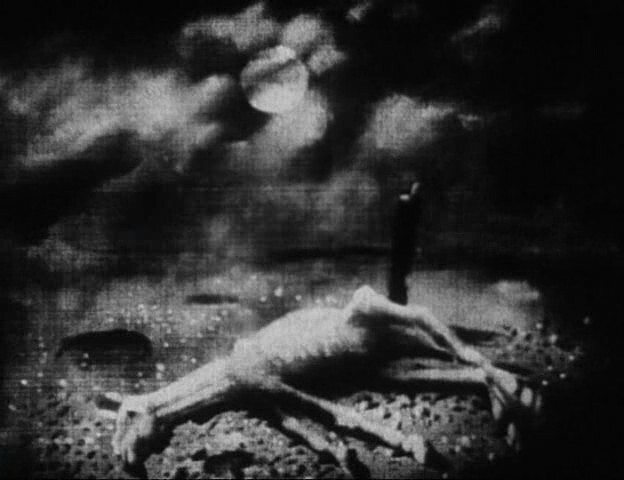 This technique is highly original, and the images produced are totally unique.The film’s imagery has more in common with surreal paintings from the era than with any other animation film from the 1930s. ‘Une nuit sur le mont chauve’ was Alexeieff’s first film on the pinscreen. Together with his wife Claire Parker he would animate five more, of which ‘The Nose’ (1963) is arguably the best. The film does not tell a story, but shows us a string of expressionistic images of animal and human forms, floating through air, and morphing into disturbing creatures. The animation is sometimes excellent (with a human figure circling through the air as a particular standout), but at times primitive, too, and the film suffers a little from the crude montage. Both shortcomings are a direct result of the limitations of the pinscreen. However, Alexeieff’s vision overcomes the film’s drawbacks, and ‘Une nuit sur le mont chauve’ is rightly considered an animation classic.